For years Norman has planned to build models depicting the art work found on Monogram boxes from the early sixties. These kits came in wide, shallow boxes that many refer to as "Flat Boxes" and included lots of extra parts enabling you to build three, six, or more versions. 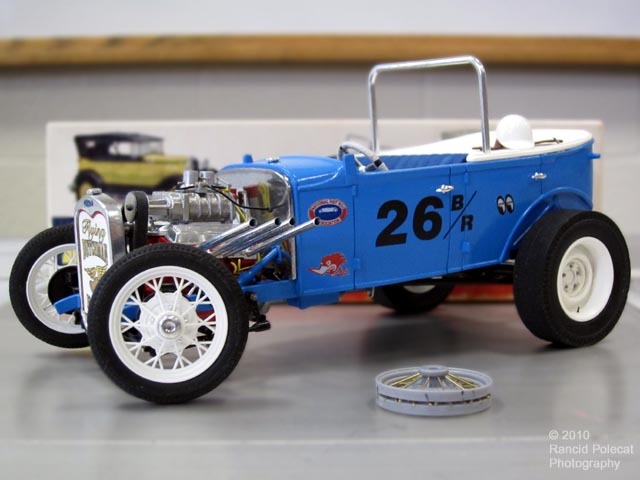 When Revell reissued the 1930 Model A Phaeton, they gave him the opportunity to build this Flat Box racer without having to build it from his original kit. This reissue also prodded Norman to make a good stock Model A wheel with scale, round spokes (you can see an unfinished wheel in the foreground above). Though Norman set out to build a faithful representation of the box art, he found that some part just plain needed improvement. The rear wheels are a great example of where he deviated from plan, but remained faithful to the spirit of the artwork by adding the steel wheel center section, lug nuts and resin valve stems for realism. One final deviation that doesn't seem to hurt one bit is the decal for the radiator block-off. Norman wanted to pay homage to Rick Hoving of the Netherlands who has been a good friend and contributor of product patterns to Norman's resin casting business for many years. When he first spotted the "Flying Dutchman" decal in the Greg's Custom Graphics product line, he knew he'd found just the right way to honor Rick.